Sometimes the simpler the food is, the more glorious it tends to be. Who says you can only get good food in posh restaurants? Food is food is food. The only difference is the combination of ingredients (how well they meld together, resulting in a gamut of taste and smell) and the packaging. Hawker food in my opinion, is simply food that is stripped to its bare essentials. It’s naked, exposed for all to see. Most of the time, it doesn’t look as pretty as what you’d get in places where you’d most probably be forking out 3 times as much. It’s all in the branding, marketing etc. But some food is so good that you really don’t need to market it – that usually happens when the food is so good that it speaks for itself. 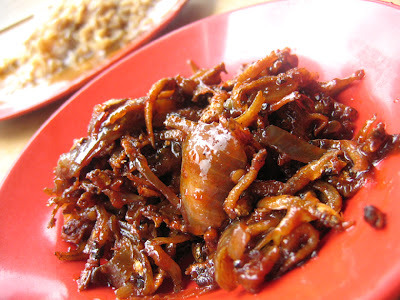 Having a ‘voice’ of its own, these types of food are themselves legends. Backed with history, each has a story to tell. 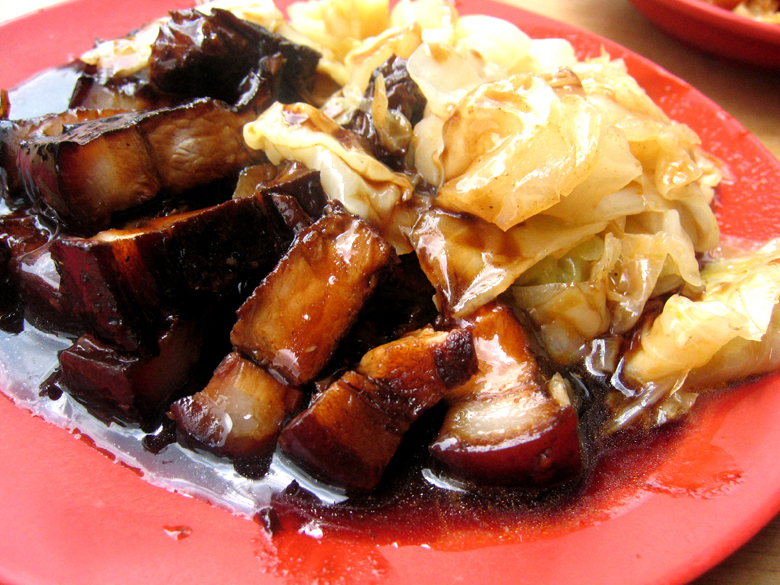 That is perhaps why I have a soft spot for hawker food. I appreciate the hard work that goes behind each day in the non-air-conditioned kitchen. Some stalls are passed down from generations. So the recipes are old and authentic. Food might seem simple and plainly functional to some, but to me, it’s multi-dimensional. It’s an entire entity. There’s so many textures, flavours, culture, history that goes into it. I dare say blood and sweat too. But I will delve into that another time. Today I want to bring to light a certain stall that most of you might have already heard of or dined at. It’s a rather popular place. Open from 11am to 3:30am, this stall can get really packed; especially during suppertime. What’s so fantastic about curry you ask? 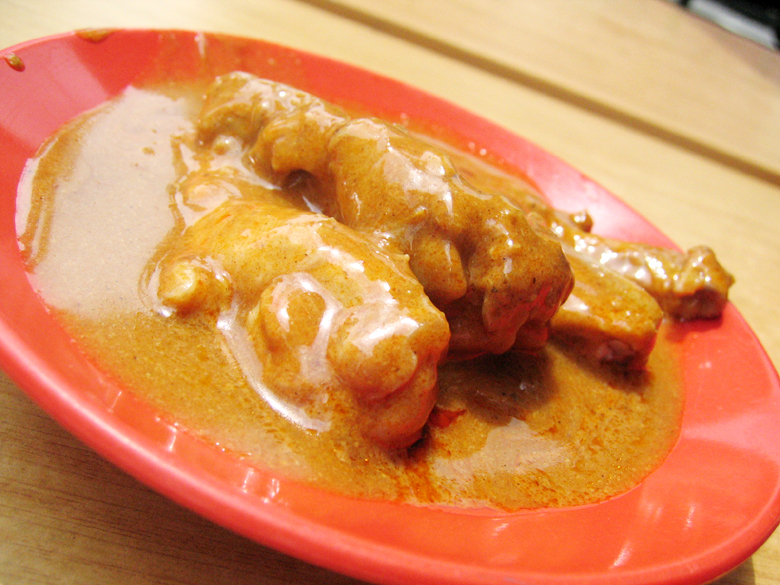 This is no ordinary curry. 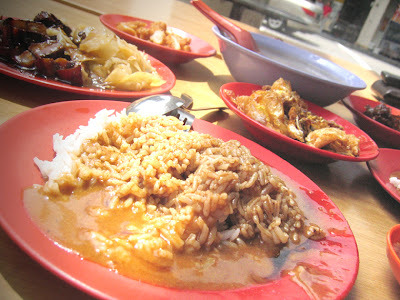 It’s Hainanese curry rice at its best. The gravy is thick and starchy (i think they put corn starch) and tasty. 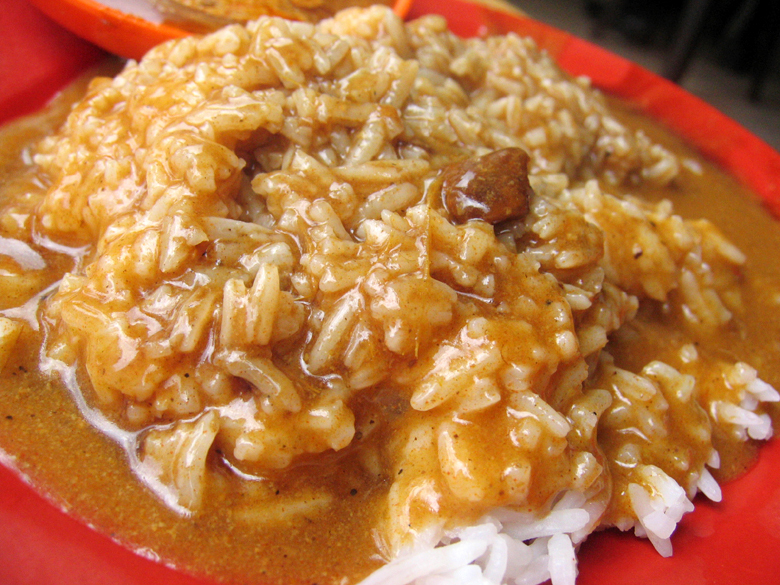 Eating rice drenched in curry of this sort makes for a different gastronomic experience. Perhaps I’m just too used to normal curry that’s why I find this type a novelty. I’ve eaten Hainanese curry rice before but that was many years ago – Midnight Curry Rice I think (they open only at midnight.. haha). So how come I’m suddenly so infatuated with this curry rice? Maybe it’s due to the fact that it’s Beach Road Scissors-Cut Curry Rice. I have Winston to thank for this. He brought me to the stall in promise that I will be super satisfied. 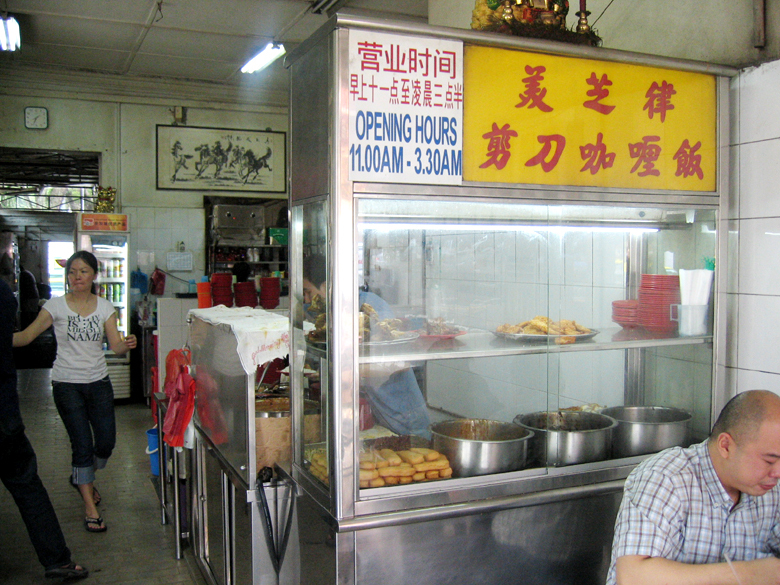 He says that it’s one of the pioneer Hainanese curry rice stall. 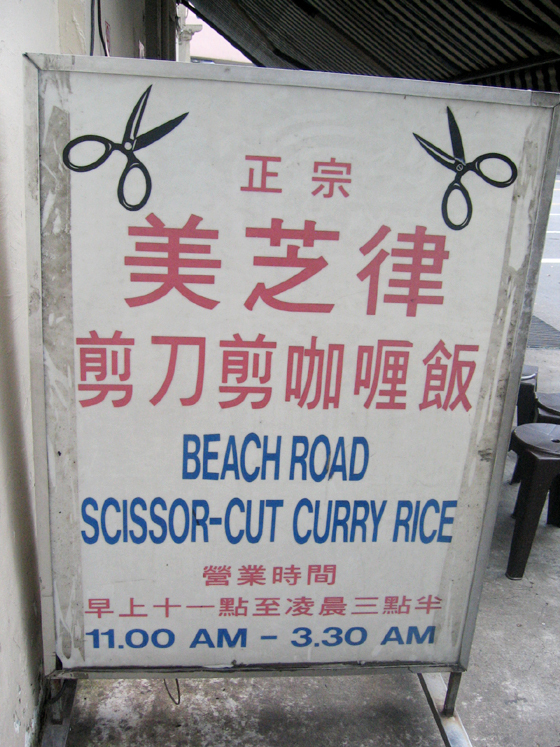 I’ve heard that they named their stall Scissors-Cut Curry Rice because they used to use scissors to cut the pork chops. I think it’s an ingenious name and catches one’s attention. I totally dig the lovely reddish-earth-brown hue. The smooth liquid glides down well and is just so yummy! Totally adored the sauce as well. I realised that I am very much a sauce person. If the sauce is done well, chances are, the dish would taste good. Well most of the time. Our entire meal cost only $14, including a generous bowl of winter melon soup. Here’s the interesting thing – the soup is sold by the drink stall. In it, there’s pork chop, winter melon and soya beans (my favourite) and it only costs $3. It’s refreshing, especially since the weather was so hot. Who knew that such a simple nondescript location would hold such a gem? 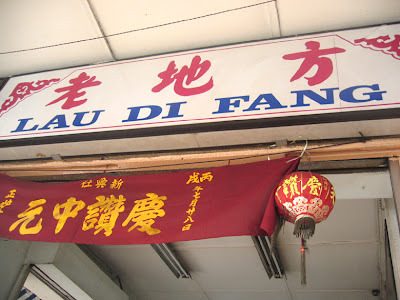 I recommend this place to all who enjoy food in its simplest form with no pretense and no nonsense – just pure soul food. uh, i don’t think that meat is deer meat. Hey isn’t this the one that used to be at Maxwell before they renovated? Anyone has an idea where I can get the recipe for the curry? I live in France and have been craving for it for a long time. Can’t seems to find it online. Its open from 11am to 3.30am not pm…anyway,whenever I have this craving I always go to this store cos is really gd but nowadays price is getting abit ex though!